Before the films Training Day (a flick that I believe was inspired by the one I'm reviewing), Menace II Society, Boyz in the Hood, and even the real life L.A. riots, there was this gritty take on gang violence that was directed by the late, not to mention taskful Dennis Hopper. Colors from an initial viewing, seems like an accurate, almost deftly authentic message movie that is brutal in nature and almost tries to scare a moviegoer away un purpose. I believe that it was made (unintentionally) for accuracy and less for catering to your everyday cinematic experience. Hopper, who had only made 3 films prior to this one, used a few of his early camera techniques from his masterpiece Easy Rider to set the tone for this sort of dramatic (not action oriented) buddy cop movie. He does this with the opening shot of the two leads driving through crime ridden L.A., and towards the last half hour or so with some ariel stuff. He was a unique director who seemed to envision what a motion picture could be long before anybody else. With the casting of two legendary screen icons (Robert Duvall and Sean Penn) and what seemed like total freedom to shoot anything and everything around the City of Angels, Hopper shot Colors and it hit theaters (with a lot of buzz) in the spring of 1988. Truth be told, there are a lot of things to admire about this vehicle. What kept me from recommend it is simple. Colors doesn't quite know what it wants to be (this is especially inherit in the relationship between Penn and Duvall). It also doesn't have a clear direction of where it wants to take the viewer. Scenes of police interrogation go on too long and seem repetitive. They don't allow anything to really take shape. Like I said earlier, Colors seems accurate. But I'm afraid, it's almost too accurate. And what you get is something that could only be tolerated by say, a real police officer who has been in the trenches and can access the films subject matter. Where as the similar Training Day was thought provoking, suspenseful, and confidently climatic, Colors just feels like a bruised and battered slog. 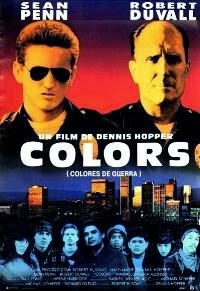 With actual, real life gang members as extras and a lingering feeling that all the main actors rode with (observed as well) actual cops (role researching must have been at an all time high) before filming began, Colors takes you through the armpit of Los Angeles (notably East L.A. and South Central L.A.) where police officers Bob Hodges (Duvall) and Danny McGavin (Penn) try to maintain and possibly rid their territory of gang violence among the Crips, the Bloods, and Hispanic street gangs. Hodges is a veteran officer who is mellow in his actions. McGavin is a hot shot, hot tempered, and high strung rookie who wants to take every measure of veritable force to get the job done (there are a couple of scenes where Penn's character hits a prisoner in custody. To my knowledge, this is probably against police procedure, but it's never noted in the film). As mentioned earlier, the luke warm dynamic between Duvall and Penn's characters is never fully realized. Throughout the two hour running time, you can't really figure out where their relationship stands. Yeah, this has the feel of a buddy cop movie where two the protagonists are constantly at odds with each other, but scenes between these guys escalate and then don't find a resolution. It's a shame that two acting heavyweights who are so good at their craft, feel like they don't belong in the same movie (if I'm not mistaken, they haven't been on screen together since). Their performances are adequate but one of them is miscast and I could never figure out which one. In conclusion, there is a lot to admire upon viewing Colors. It's got decent acting, solid direction, and at least it's about something that was relevant at the time. Yes, the events depicted are slightly outdated and there is a sort of preachiness to the proceedings (the soundtrack by the talented Herbie Hancock is wrong for what's on screen because it deflates the dramatic momentum), but it's as strong of a mixed review as I could ever give a motion picture. It has good intentions, promotes a strong message, and makes you think ever so slightly. As an unintentional sort of staged docudrama, it gets the job done. As entertainment value or something viewed as a hearty movie going experience, Colors sadly, is just "black and white."